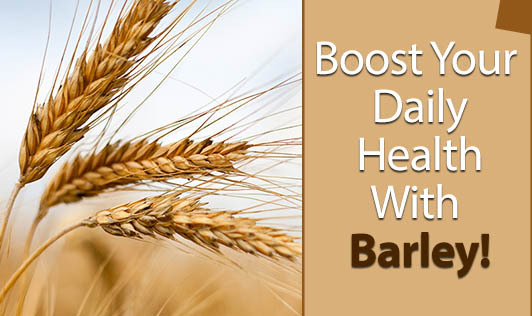 Boost Your Daily Health With Barley! This unique wonder grain is filled with significant number of benefits. The magic ingredient of barley, ‘beta- glucan' contributes to the maximum health benefits this grain can offer you. • Beta- glucan in barley is known to reduce cholesterol. • Its high content of insoluble fiber helps in flushing out intestinal wastes efficiently. It serves as a great cure for intestinal problems like constipation. It also promotes the buildup of healthy bacteria in the intestines. • Barley water being a natural diuretic, improves kidney functioning and also helps in reducing water retention. • Barley can prevent arthritis and rheumatic problems if consumed regularly. A glass of barley water every day can boost your daily health. Include barley in your daily diet. Your daily health drink: Boil 1 table spoon of barley seeds that have been soaked overnight in 200ml of water for 5 minutes. To make it tasty, add fresh lemon or orange juice. As a secret health ingredient: You can add boiled barley seeds to your salads, in soups and your daily vegetable gravies.